70 years had passed since India became independent. Also, it has been 3.5 years since the new government under Narendra Modi assumed charge at the Centre. Is India really in the middle of a transformation under the Modi government? Are we seeing history in the making without fully realising it? The book India @70 Modi @3.5 captures the story of India’s development since 2014 with the backdrop of its progress as an independent nation. The book is edited by Bibek Debroy and Ashok Malik. Wisdom Tree is the publishing house. This book brings together acclaimed economists, scholars, diplomats and strategicians who dispassionately analyse India’s growth story under the Modi Sarkar. There are about 18 contributors who have come up with an excellent analysis of contemporary issues like – plugging massive public spending leaks, the cooking gas revolution, the campaign to clean India, creating 100 smart cities, the focus on renewable energy and making India a responsible global leader. Aspirants will get fresh insights about the ground realities as the book covers 18 main issues or topics, and this would be useful while preparing essays and general studies answers in UPSC CSE Mains. Bibek Debroy is a member of NITI Aayog. He is an economist who excellent academic records. He has also authored severed books. Ashok Malik has been Distinguished Fellow at the Observer Research Foundation. He has a background in media and has been a prominent columnist in a variety of publications. 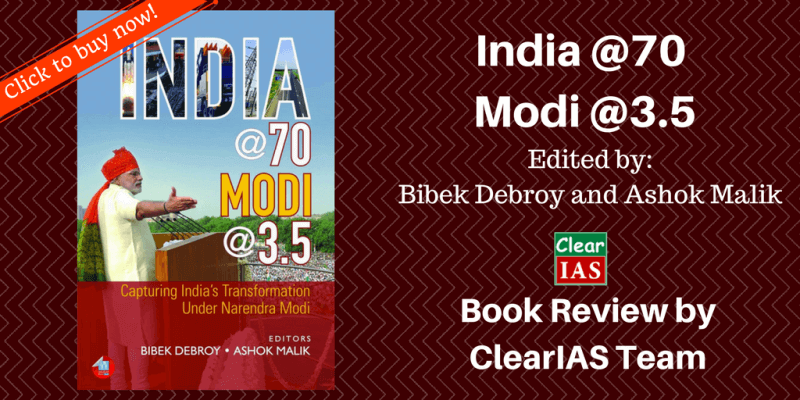 How can you buy ‘India @70 Modi @3.5 Capturing India’s Transformation Under Narendra Modi’? 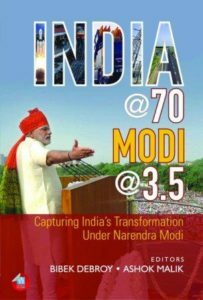 India @70 Modi @3.5 Capturing India’s Transformation Under Narendra Modi – Click to buy online from Amazon. OR Click to buy online from Flipkart. Book Description: The book India @70 Modi @3.5 captures the story of India’s development since 2014 with the backdrop of its progress as an independent nation. The book is edited by Bibek Debroy and Ashok Malik. Wisdom Tree is the publishing house. The book India @70 Modi @3.5 captures the story of India’s development since 2014 with the backdrop of its progress as an independent nation. As the book has 18 useful articles covering different aspects of the contemporory India, we suggest aspirants go through the same. A good extra-read.